How we doin'? Having just passed the 10,000-driver mark, we're eager to check in with our members. We rely on your feedback to help us improve our service and ensure we're providing a smooth, convenient carsharing experience. Our Annual Member Survey should take about 15 minutes to complete – no biggie, right? Last year, about 850 of you participated. Not bad, but we can do better, so as encouragement, when you complete the survey we'll enter you in our draw to win $200 carsharing credit. Take the survey now! pro tip: what to do when your modo stall is occupied? We've worked with cities throughout Metro Vancouver to ensure Modo members have a number of prime parking options available through designated on-street stalls and allowances within Permit-Only or Resident-Only zones. Occasionally, our on-street stalls are occupied by non-Modo vehicles, leaving members wondering what to do. Read our blog post for pro-tips regarding parking rules & etiquette for a quick refresher to keep your carsharing experience as convenient as possible! This month, we're shining the spotlight on one of our many recent vehicle moves, the vehicle location formerly known as "Guelph Park." Not only did this location get a shiny new silver Sentra, but we also changed the name, taking our cue from the Parks Board. Shout out to our member who was the first to discover the inside joke. Happy sharing! 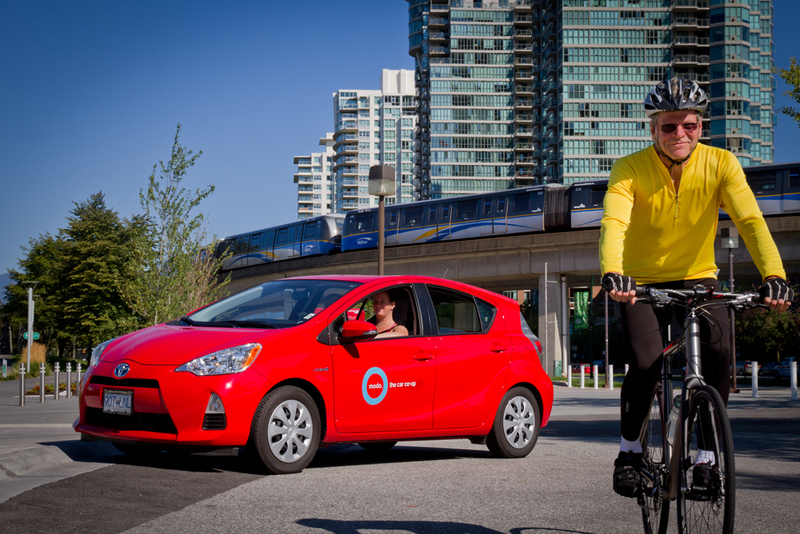 Did you know HUB members get free registration plus a $25 carsharing credit with Modo? Membership only costs $30 and comes with loads of additional benefits as well! To claim, drop a note to freestuff@modo.coop with the subject line "HUB member credit," and we'll take it from there! Modo members also have access to some pretty awesome Perks from our friends at HUB to make your life more bikeable. Receive a free 30-minute consultation on customized bike-friendly solutions for your business, plus a 10% discount on any workplace cycling workshops or bikeability assessments. Discover more Modo Member Perks at modo.coop/perks. >> MODO 8K RECAP "We couldn't have asked for a better day!" Almost 1,000 runners hit the Stanley Park Seawall on March 23 for a fun, sunny run, followed by Modo's first-ever Community Fair. Read about it on our blog! >> ROAMING WITH FRIENDS Did you know Modo members have access to 352 vehicles across Southern BC? That's in addition to vehicles in cities across the globe! >> POLICY CHANGES On March 17, we announced changes to our Co-op and Casual member plans which took effect April 1. >> CO-OP LAYAWAY PLAN Not everyone has $500 lying around for a Co-op membership – even if it is refundable. So we're making it easier for Casual members to convert. >> VIDEO: TAKE A HIKE Thousands of dollars was raised for our charity partner, Take a Hike Foundation, as part of the #Modo8k. Watch this Global BC report from Stanley Park on race day to learn how this impacts the charity. 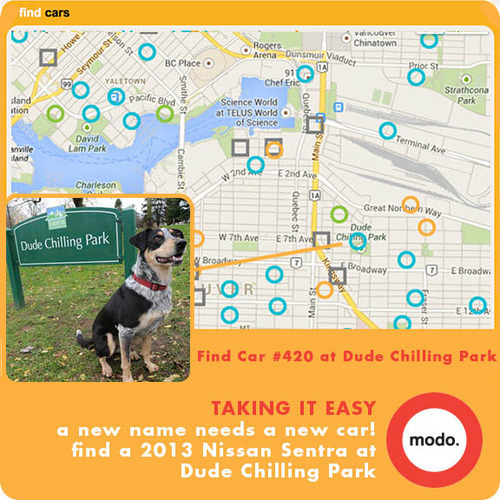 >> READ: MODO IN METRO Is Vancouver the carsharing capital of North America? Metro News reporter Emily Jackson does a good job explaining what makes Modo stand out. 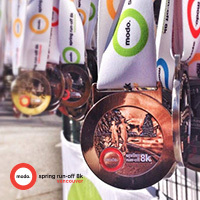 You've completed your first 8k of the season, celebrated with friends and worn your #Modo8k medal with pride... are you ready for more? As Automobile Sponsor of the upcoming Scotiabank Vancouver Half Marathon & 5k (June 22) and Eastside 10k (September 13), we want to bring you along for the ride. Modo members get $5 off entry for each race by entering the promo code MODO5 (all caps) when registering online. CONTEST: Enter to win free entry! Snap a selfie in front of a Modo on your next training run and email to freestuff@modo.coop (subject: "Selfie for race entry"). Include the name of the race you'd like to win free race entry for; one per entry; enter as many times as you like. Deadline is May 1, 2014. Add Modo's Community Calendar to your iCal or Google Calendar! Join supporters of the Britannia Secondary School garden and the Sega Girls School (Tanzania) 6–11pm for delicious food, a silent auction and award-winning films. Tickets by a suggested donation of $10–20. All proceeds pay for school garden supplies and education. Reel to Real offers year-round media arts programming for youth in BC. Their annual film festival celebrates its Sweet 16 this year and features fantastic local and international films. Schedule and ticket info here. Celebrate the transformative power of words in the heart of Vancouver's spoken word community, Commercial Drive. Events are held at several venues near Commercial Drive, visit the Verses Festival website for details and ticket info. The public is invited to an open house to review and comment on a draft master plan for John Hendry Park from 5–8pm at the Trout Lake Community Centre. Drop in anytime. Learn more about the project here. Celebrate Earth Day on April 22 at the VCC Broadway Campus from 10–2pm where you can learn about local products and services that help people live greener, healthier and more sustainable lives. VCC Downtown will host the Green Living Fair on April 23 from 10–2pm. Find our Modo volunteers at both and ask about our special offer for VCC staff and students. Join the largest Earth Day celebration in BC on Saturday, April from 10–9pm at the new Surrey City Hall Plaza! Lots of fun activities and music for all ages, headlined by Said The Whale. Find Modo with the City of Surrey team as we show off our electric vehicles. Find TravelSmart's guide for getting to Party for the Planet here. Find a 2014 silver Dodge Grand Caravan (#523) instead of a 2012 Scion XD. Find a 2012 red Toyota Prius C (#475) and a 2012 silver Scion XD (#398) in the EasyPark lot at 856 Richards Street, in between Robson and Smithe Street. Longtime members may remember this location had Modo vehicles from 2008 to 2011 – we're back! A 2013 green Fiat 500 convertible (#512) will be here until sometime in May, when we expect it will move to its permanent home in the Downtown Eastside. Find a 2009 red Nissan Versa hatch (#248) in a designated stall on Thornton Street, between Terminal and Evans Avenue. Park on the east side of the street, three car-lengths north of Terminal. A 2014 yellow Toyota Prius C (#517) and a 2014 blue Nissan Versa Note (#516) have joined the Chevrolet Orlando. Our 2007 green Toyota Yaris sedan (#048), formerly under W 1st & Pennyfarthing in Engage, has moved west across the railroad tracks to a designated stall behind the Molson's brewery in the 1600 block of West 1st Avenue. This location will now be found under Molson's in Engage. There's now a 2013 red Fiat 500 convertible (#466) instead of a Scion FR-S. There's now a 2013 red Scion FR-S (#467) instead of a 2011 Nissan Juke. Find a 2014 silver Nissan Sentra (#420) instead of a 2007 Toyota Corolla. This location, formerly known as Guelph Park, will now be found under Dude Chilling Park in Engage. Find a 2009 white Toyota Yaris hatch (#273) in the alley behind 355 East 15th Avenue, between Prince Edward Street and Sophia Street, in a designated stall. This is just west of the main entrance to Mount St. Joseph Hospital. Find a 2014 silver Nissan Juke (#511) in the parkade below 2778 East Hastings Street, on the south side of Hastings between Slocan and Kaslo Street, in stall #9. Find a 2009 green Nissan Cube (#230) instead of a 2013 Chevrolet Orlando. Find a 2011 red NIssan Juke (#302) and a 2013 white Chevrolet Orlando (#489), instead of a 2009 Nissan Cube and a 2012 Fiat 500c. We're returned to Sapperton SkyTrain with a 2013 blue Nissan Sentra (#502). Thanks to all our members for your patience while we worked out parking issues at this location. Find a 2014 blue Toyota Prius C (#507) and a 2014 blue Nissan Versa Note (#495) in two designated stalls behind the Surrey Eye Care Centre at 13450 104 Avenue, on the southwest corner of 104 Avenue & City Parkway. We expect these cars will move to a nearby permanent location within a few weeks. There's now a 2013 red Toyota Prius C (#501) instead of a 2012 Toyota Matrix, alongside our Nissan Cube. Find a 2014 silver Dodge Grand Caravan (#520) in the Troll's Restaurant overflow lot at 6521 Bruce Street, just west of Royal Avenue. We briefly held vehicles in Horseshoe Bay in 2008 and we're back! We're thrilled to welcome BC's newest car co-op, the Coast Car Co-op, which began operations in Gibsons in March with two cars. Modo members in good standing are eligible to roam in Gibsons; your fob will let you access their cars. Find a 2013 orange Toyota Pruis C near the small fountain across from Winegarden Park on Gower Point Road, and a 2014 red Dodge Grand Caravan in the parking lot at Wheatberries Restaurant, 818 Gibsons Way.